Highland malaria remains a major global problem despite several decades of control efforts. The development and survival of the Plasmodium parasite and its mosquito vectors are associated with climatic factors, raising concern over the consequences of global climate change. It has been demonstrated that the inter-annual temperature variability modulates the altitudinal distribution of malaria incidence, expanding the disease into higher elevations during warmer years. 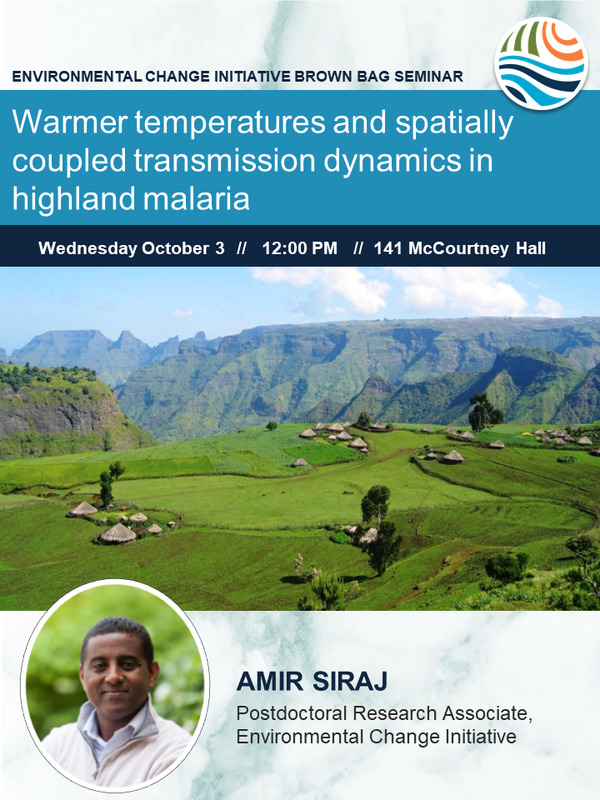 While the analysis of retrospective data for such epidemic-prone areas has suggested interactions between regions of contrasting elevation and epidemiology, the resulting transmission dynamics have remained unexplored. To examine the dynamics, including in response to future climate, we identified two main regions: a ‘spatial-reservoir’ region comprising of localities with relatively stable transmission and cases reported year-round; and an ‘expansion’ region whose localities are more prone to epidemic outbreaks and report cases only during these events. We then formulated a process-based model, coupling transmission in humans and vectors, and between these two adjacent regions, with key parameters a function of climatic factors. Our results show that a spatial model coupled through the movement of infectious and susceptible humans fits the data best when we account for the different climatic conditions of these two regions. Assuming the seasonality of temperature and rainfall in the two regions remains unchanged, a 1oC increase in local temperature would result in increases of 18% and 112% in annual cases for the reservoir and expansion regions respectively. These changes would also be accompanied by differential effects on the seasonality of transmission, where the reservoir region becomes more stable with smaller peaks, and the expansion region develops larger peaks. These results should apply more broadly to other highland regions in Africa and South America, both in terms of the increases in number of people at risk of malaria under unmitigated conditions, and the type of interventions that would be most appropriate given the changing seasonal patterns.